For an introduction to this topic, including a brief hands-on experience, see First Look: InterSystems IRIS in Docker Containers. You can get a Docker container image for InterSystems IRIS Community Edition, which comes with a free temporary license, from the Docker Store; see Downloading the InterSystems IRIS Docker Image for details. Containers are very efficient; an application within a container is packaged with only the elements needed to run it and make it accessible to the required connections, services, and interfaces, and the container runs as a single operating system process that requires no more resources than any other executable. Containers support clean movement of an application between environments  for example, from development to test and then to production  thereby reducing the conflicts typical of departments with different objectives building in separate environments. Developers can focus on the latest code and libraries, quality developers on testing and defect description, and operations engineers on the overall solution infrastructure including networking, high availability, data durability, and so on. Containers provide the agility, flexibility, and repeatability needed to revolutionize the way many organizations respond to business and technology needs. Containers clearly separate the application provisioning process, including the build phase, from the run process, supporting a DevOps approach and allowing an organization to adopt a uniform more agile delivery methodology and architecture (microservices). For an introduction to containers and container images from an InterSystems product manager, see What is a Container? and What is a Container Image? on InterSystems Developer Community. Docker containers, specifically, are ubiquitous; they can be found in public and private clouds and are supported on virtual machines (VMs) and bare metal. Docker has penetrated to the extent that all major public cloud "infrastructure as a service" (IaaS) providers support specific container services for the benefit of organizations reducing system administration costs by using Docker containers and letting the cloud provider handle the infrastructure. InterSystems has been supporting InterSystems IRIS™ in Docker containers for some time and is committed to enabling its customers to take advantage of this innovative technology. For technical information and to learn about Docker technology step-by-step from the beginning, please see the Docker documentation site. Because a Docker container packages only the elements needed to run a containerized application and executes the application natively, it provides standard, well-understood application configuration, behavior, and access. If you are experienced with InterSystems IRIS running on Linux, it doesn’t matter what physical, virtual, or cloud system and distribution your Linux-based InterSystems IRIS container is running on; you interact with it in the same way regardless, just as you would with traditional InterSystems IRIS instances running on different Linux systems. InterSystems-provided images  A container image is the executable package, while a container is a runtime instance of an image. InterSystems provides Docker images containing a fully-installed instance of InterSystems IRIS, as well as other associated images, as described in Using InterSystems IRIS Docker Images. You can also use an InterSystems IRIS image from InterSystems as the basis for an image containing your InterSystems IRIS-based application; for more information, see Creating InterSystems IRIS Docker Images. The iris-main program  The iris-main program enables InterSystems IRIS and other products to satisfy the requirements of applications running in Docker containers. The entrypoint application, the main process started when a container is started, is required to block (that is, wait) until its work is complete, but the command starting InterSystems IRIS does not run as a blocking process. The iris-main program solves this by starting InterSystems IRIS and then continuing to run as the blocking entrypoint application. The program also offers a number of options to help tailor the behavior of InterSystems IRIS within a container. For more information about iris-main, see The iris-main Program. The durable %SYS features enables persistent storage of instance-specific data  such as user definitions, audit records, and the log, journal, and WIJ files  when InterSystems IRIS is run in a container, allowing a single instance to run sequentially in multiple containers over time. For example, if you run an InterSystems IRIS container using durable %SYS, you can upgrade the instance by stopping the original container and running a new one that uses the instance-specific data created by the old one. For information about upgrading, see Upgrading InterSystems IRIS Containers; for detailed information on durable %SYS, see Durable %SYS for Persistent Instance Data. This section covers the important basic elements of creating and using Docker containers. In essence, a Docker container runs a single primary process, which can spawn child processes; anything that can be managed by a single blocking process (one that waits until its work is complete) can be packaged and run in a container. A containerized application, while remaining wholly within the container, does not run fully on the operating system (OS) on which the container is running, nor does the container hold an entire operating system for the application to run on. Instead, an application in a Docker container runs natively on the kernel of the host system, while the container provides only the elements needed to run it and make it accessible to the required connections, services, and interfaces  a runtime environment (including file system), the code, libraries, environment variables, and configuration files. Because it packages only these elements and executes the application natively, a Docker container is both very efficient (running as a discrete, manageable operating system process that takes no more memory than any other executable) and fully portable (remaining completely isolated from the host environment by default, accessing local files and ports only if configured to do so), while at the same time providing standard, well-understood application configuration, behavior, and access. The isolation of the application from the host environment is a very important element of containerization, with many significant implications. Perhaps most important of these is the fact that unless specifically configured to do so, a containerized application does not write persistent data, because whatever it writes inside the container is lost when the container is removed and replaced by a new container. Because data persistence is usually a requirement for applications, arranging for data to be stored outside of the container and made available to other and future containers is an important aspect of containerized application deployment. A container image is the executable package, while a container is a runtime instance of an image  that is, what the image becomes in memory when actually executed. In this sense an image and a container are like any other software that exists in executable form; the image is the executable and the container is the running software that results from executing the image. A Docker image is defined in a Dockerfile, which begins with a base image providing the runtime environment for whatever is to be executed in the container. For example, InterSystems uses Ubuntu 16.04 LTS as a base for its InterSystems IRIS images, so the InterSystems IRIS instance in a container created from an InterSystems image is running in an Ubuntu 16.04 LTS environment. Next come specifications for everything needed to prepare for execution of the application  for example, copying or downloading files, setting environment variables, and installing the application. The final step is to define the launch of the application. The image is created by issuing a docker build command specifying the Dockerfile’s location. The resulting image is placed in the Docker image registry of the local host, from which it can be copied to other Docker image registries. docker pull  Downloads the image from the repository. docker create  Defines the container instance and its parameters. docker start  Starts (launches) the container. For convenience, however, the docker run command combines three separate Docker commands, which it executes in sequence, and is the typical means of creating and starting a container. The docker run command has a number of options, and it is important to remember that the command that creates the container instance defines its characteristics for its operational lifetime; while a running container can be stopped and then restarted (not a typical practice in production environments), the aspects of its execution determined by the docker run command cannot be changed. For instance, a storage location can be mounted as a volume within the container with an option in the docker run command (for example, --volume /home/storage:/storage3), but the volumes mounted in this fashion in the command are fixed for that instantiation of the image; they cannot be modified or added to. As with other UNIX® and Linux commands, options to docker commands such as docker run can be specified in their long forms, in which case they are preceded by two hyphens, or their short form, preceded by one. In this document, the long forms are used throughout for clarity, for example --volume rather than -v.
The Docker Engine consists of an open source containerization technology combined with a workflow for building and running containerized applications. Docker images from InterSystems comply with the OCI support specification, and are supported on Docker Enterprise Edition and Community Edition, version 18.03 and later. Docker EE only is supported for production environments. To install the Docker engine on your servers, see Install Docker in the Docker documentation. Docker supports a number of different storage drivers to manage images. To run InterSystems IRIS images, you may need to change the default driver, which depends on the host on which the Docker Engine is installed. For more information about supported storage drivers, see Docker Storage Driver. InterSystems supports use of the InterSystems IRIS Docker images it provides on Linux platforms, and the instructions and procedures in this document are intended to be used on Linux. Rather than executing containers as native processes, as on Linux platforms, Docker for Windows creates a Linux VM running under Hyper-V, the Windows virtualizer, to host containers. These additional layers add complexity that prevents InterSystems from supporting Docker for Windows at this time. We understand, however, that for testing and other specific purposes, you may want to run InterSystems IRIS-based containers from InterSystems under Docker for Windows. For information about the differences between Docker for Windows and Docker for Linux that InterSystems is aware of as they apply to working with InterSystems-provided container images, see Using InterSystems IRIS Containers with Docker for Windows on InterSystems Developer Community; for general information about using Docker for Windows, see Getting started with Docker for Windows in the Docker documentation. Like any InterSystems IRIS instance, an instance running in a container requires a license key (typically called iris.key). For general information about InterSystems IRIS license keys, see the “Managing InterSystems IRIS Licensing” chapter of the System Administration Guide. The InterSystems IRIS Community Edition image available from the Docker Store (as described in the previous section) comes with a special free temporary license. Generally, however, license keys are not, and cannot be, included in an InterSystems IRIS container image. Instead, you must stage a license key in a storage location accessible to the container, typically a mounted volume, and provide some mechanism for copying it into the container, where it can be activated for the InterSystems IRIS instance running there. The --key option copies the license key from the location you specify to the mgr/ directory of the InterSystems IRIS instance, which means that it is automatically activated when the instance starts. The license key must not be located on the local file system inside the container; typically, it is on a storage location mounted as a volume by the container with the --volume option of the docker run command. Optionally configure the InterSystems IRIS instance in the container as a license server (see the “Managing InterSystems IRIS Licensing” chapter of the System Administration Guide), which enables it to serve license keys contained in the staging location you specify to itself .iand to instances in other containers in the deployment. Both failover partners in a mirror can optionally be configured as the license server. Specify the ID of the license to be served to the instance, by itself if configured as a license server or by another instance already configured as a license server. The hostname and port of the configured license server. If these arguments specify the instance in the container, that instance is configured as a license server; if not, theu specify another instance that is already configurad as a license server. The default InterSystems IRIS license server port is 4002. If the host1,port1 arguments specify the instance in the current container to be configured as a license server, identifies the staging location in which the license keys it is to serve are located. This directory must not be on the local file system inside the container; typically, it is on a storage location mounted as a volume by the container with the --volume option of the docker run command. If the host1,port1 arguments do not specify the instance in the current container as the license server, but instead identify another instance, this argument is ignored. If the host1,port1 arguments specify the instance in the current container to be configured as a license server and that instance is a failover member in a mirror, these arguments specify the other failover instance to be configured as a license server and identifis the staging area for the licenses it is to serve. The contents of directory1 and directory2 must be the same; the simplest way to effect this is to place the license directory on a storage volume mounted by both containers. If the instance specified by the host1,port1 arguments is not a mirror member, these arguments are ignored. See The iris-main Program for a list of iris-main options, and Running InterSystems IRIS Containers for examples of using the --key and --license-config options. InterSystems IRIS is installed with several predefined user accounts, including the _SYSTEM account (see Predefined Users Accounts in the “Users” chapter of the Security Administration Guide), The default password for the predefined accounts is SYS. You can use _SYSTEM/SYS as credentials for the first login to an InterSystems IRIS instance deployed in a container, but for security reasons you are immediately prompted to change the password. This is true whether you log in using the iris session command or the management portal. The iris-main --password-file option can be used to change the default password in scripts and other automation; for more information, see The iris-main Program. Default values in InterSystems containers are exposed through the standard label mechanism so that needed information can be discovered, as shown in the following example. Users familiar with InterSystems technology will recognize the typical default ports and other useful information. Update the base and set environment variables as needed. Download the InterSystems IRIS installation kit, or copy it in if it is available on the local file system. Images officially supported by InterSystems contain an internally developed program called iris-main that is used as the entrypoint application to aid in handling InterSystems IRIS inside a container; this means copying the program into the Dockerfile and declaring it as the entrypoint. The iris-main program is described in The iris-main Program. Given the complexities in the preceding, the most common and recommended approach to building an image that includes your InterSystems IRIS-based application along with InterSystems IRIS is to base it on an existing InterSystems IRIS image provided by InterSystems, adding the dependencies relevant to your own application solution. This means starting with an image in which InterSystems IRIS is already installed with iris-main as the entrypoint; whatever you include in the Dockerfile is executed subsequent to this, which means you can start and issue commands to the InterSystems IRIS instance. Starts with an InterSystems IRIS image as base. Copies in the XML code file. Installs the fortune command in the container. Starts InterSystems IRIS and uses iris session (see Connecting to an InterSystems IRIS Instance in the “Using Multiple Instances of InterSystems IRIS” chapter of the System Administration Guide) to compile the code, then shuts down the instance. By updating the FROM command in the Dockerfile as needed, then issuing the docker build command in a directory containing both the Dockerfile and the _ZSTART.xml file, you can create an image that, when run interactively with the command docker run -it image, runs the code in the InterSystems IRIS instance and thereby outputs the result of the fortune command every 10 seconds. In exploring this approach, you can use the InterSystems IRIS Community Edition image described in Downloading the InterSystems IRIS Docker Image as a base image. Bear in mind, however, that it includes some functionality restrictions. There are several requirements an application must satisfy in order to run in a Docker container. The iris-main program was developed by InterSystems to enable InterSystems IRIS and its other products to meet these requirements. The main process started by the docker run command, called the entrypoint, is required to block (that is, wait) until its work is complete. In the case of a long-running entrypoint application, this process should block until it's been intentionally shut down. InterSystems IRIS is typically started using the iris start command, which spawns a number of InterSystems IRIS processes and returns control to the command line. Because it does not run as a blocking process, iris is unsuitable for use as the Docker entrypoint application. Docker expects the main container process to shut down in response to the docker stop command. The default behavior of docker stop is to send the SIGTERM signal to the entrypoint application, wait ten seconds, and then send the SIGKILL signal, which is not an acceptable way to stop a database under production workloads. Instead, iris-main intercepts Docker’s signals and invokes the iris stop command. When a container is stopped by means other than the docker stop command, for example when the Docker daemon is restarted or the host is rebooted, the entrypoint application must carry out whatever tasks are required to bring the container back up to a stable running state in response to the docker start command. As of this writing, iris-main does not have any special handling for an InterSystems IRIS instance that was brought down ungracefully, and instead relies on existing InterSystems IRIS functionality; it does, however, execute all operations specified using the --before and --after options (see the table that follows). In addition to addressing the issues discussed in the foregoing, iris-main provides a number of options to help tailor the behavior of InterSystems IRIS within a container. The options provided by iris-main are shown in the list that follows; examples of their use are provided in Running InterSystems IRIS Containers. Options for iris-main appear after the image name in a docker run command, while the Docker options appear before it. As with the docker command, the options have a long form in which two hyphens are used and a short form using only one. The iris-main program is configured to append its logging output to previous output, so that, when the InterSystems IRIS container is restarted, some record of how and why it shut down remains available. Change the default password for the predefined InterSystems IRIS accounts to the string contained in the file, and then delete the file. This option is primarily for use in scripts and other automation; when using it, bear in mind the risks of committing the password to a file for any significant length of time. The first manual login to InterSystems IRIS after the container starts includes a mandatory default password change; for more information, see Changing the Default InterSystems IRIS Password. This section describes the durable %SYS feature of InterSystems IRIS, which enables persistent storage of instance-specific data when InterSystems IRIS is run within a container, and explains how to use it. Saving a variety of instance-specific data for use by the instance and by the instance in an upgraded container that replaces it, including the log, journal and WIJ files and the system databases that contain user definitions and other security information as well as audit records. Indicating where this data is stored, and where it can be found when running the upgraded image to create the upgraded container. The /temp directory for temporary files. Durable %SYS activity is logged in the messages.log file; if you have any problems in using this feature, examine this log for information that may help. For information about how to read this log from outside the container, see The iris-main Program. Several InterSystems IRIS system files. There must be at least 200 MB of space available on the specified volume for the durable %SYS directory to initialize. For various reasons, however, including operational files such as journal records and the expansion of system databases, the amount of data in the directory can increase significantly. In this example, the durable %SYS directory would be /data/dur/iconfig outside the container, and /dur/iconfig inside the container. When running InterSystems IRIS containers, always use the --init option to indicate that an init process should be used as PID 1 within the container, ensuring that the usual responsibilities of an init system are performed inside the container. For more information on this option, see the Docker documentation. The --publish option publishes the InterSystems IRIS instance’s web server port (52773 by default) to the host, so that the instance’s management portal can be loaded into a browser on any host. The specified external volume is mounted. The specified durable %SYS directory is created. The directories and files listed in Contents of the Durable %SYS Directory are copied from their installed locations to the durable %SYS directory (the originals remain in place). All of the instance’s internal pointers are reset to the durable %SYS directory and the instance uses the data it contains. If for any reason the process of copying the durable %SYS data and resetting internal pointers fails, the durable %SYS directory is marked as incomplete; if you try again with the same directory, the data in it is deleted before the durable %SYS process starts. 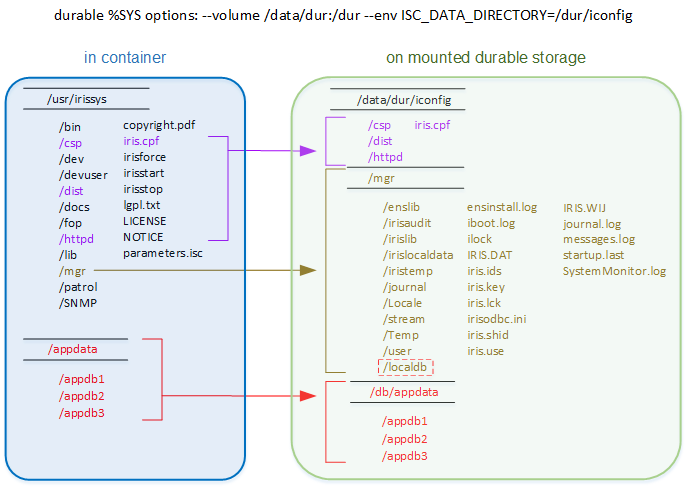 If the durable %SYS directory specified by the ISC_DATA_DIRECTORY environment variable already exists and contains data (file or subdirectories) but does not contain a /mgr subdirectory, no data is copied; the container does not start, and the reason (data other than durable %SYS in the directory) is logged to standard output by the iris-main program, as described in The iris-main Program. In the case of the example provided, the InterSystems IRIS instance running in container iris21 is configured to use the host path /data/dur/iconfig (which is the path /dur/iconfig inside the container) as the directory for persistent storage of all the files listed in Contents of the Durable %SYS Directory. If durable %SYS data does not already exist in the host directory /data/dur/iconfig (container directory /dur/iconfig) it is copied there from the installation directory. Either way, the instance’s internal pointers are set to container directory /dur/iconfig (host directory /data/dur/iconfig). See Running InterSystems IRIS Containers for examples of launching an InterSystems IRIS container with durable %SYS. The following illustration shows the relationship between the installation directory of a newly installed InterSystems IRIS container and the external durable %SYS directory, with external application databases also depicted. For detail information on the iris command, see Controlling InterSystems IRIS Instances. Within InterSystems IRIS, call $SYSTEM.Util.InstallDirectory() or $SYSTEM.Util.GetEnviron(ISC_DATA_DIRECTORY). When a container is run with the ISC_DATA_DIRECTORY environment variable, pointers are set to the durable %SYS files only if the specified volume is successfully mounted. If ISC_DATA_DIRECTORY is specified but the needed --volume /external_host:/durable_storage option is omitted from the docker run command, the instance fails to start and an error message is generated. If the --volume option is included but Docker cannot successfully mount the specified volume, it creates the external storage directory and the volume within the container; in this case, the instance data is copied to the durable %SYS directory, as described for "If the durable %SYS directory specified by ISC_DATA_DIRECTORY does not exist" in Running an InterSystems IRIS Container with Durable %SYS. If ISC_DATA_DIRECTORY is not specified, the InterSystems IRIS instance uses the instance-specific data within the container, and therefore operates as a new instance. To use durable %SYS, you must therefore ensure that all methods by which your InterSystems IRIS containers are run incorporate these two options. In the interests of performance and recoverability, InterSystems recommends that you locate the primary and secondary journal directories of each InterSystems IRIS instance on two separate file systems, which should also be separate from those hosting InterSystems IRIS executables, system databases and the IRIS.WIJ file, with the latter optionally on a fourth file system. Following InterSystems IRIS installation, however, the primary and secondary journal directories are set to the same path, install-dir/mgr/journal, and thus may both be set to /mgr/journal in the durable %SYS directory when durable %SYS is in use. After the container is started, you can reconfigure the external locations of the primary and secondary directories using the Management Portal or by editing the iris.cpf file, as long as the volumes you relocate them to are always specified when running a new image to upgrade the InterSystems IRIS instance. You can also configure separate file systems when launching the container, as described in Running InterSystems IRIS Containers. When the durable %SYS directory is in use, the IRIS.WIJ file and some system databases are already separated from the InterSystems IRIS executables, which are inside the container. Under some circumstances, colocating the IRIS.WIJ file with your application databases instead may improve performance. See File System Recommendations in the "File System and Storage Configuration Recommendations" chapter of the Installation Guide for more information about separation of file systems for InterSystems IRIS. The sample docker run commands in this section include only the options relevant to each example and omit options that in practice would be included, as shown (for example) in the sample command in Running an InterSystems IRIS Container with Durable %SYS. The following are examples of docker run commands for launching InterSystems IRIS containers using iris-main options. As described in License Keys for InterSystems IRIS Containers, the required InterSystems IRIS license key must be brought into the container so that the instance can operate. In the example that follows using the iris-main -key option as well as the needed options for durable %SYS (see Ensuring that Durable %SYS is Specified and Mounted), the license key is staged in the key/ directory on the volume mounted for the durable %SYS directory  that is, /data/durable/key/ on the external storage, /dur/key/ inside the container  and is copied to the mgr/ directory within the durable %SYS directory ( /data/durable/iconfig/mgr/ on the external storage, /dur/iconfig/mgr/ in the container) before the InterSystems IRIS instance is started. Because it is in the mgr/ directory, it is automatically activated when the instance starts. intersystems/iris:2019.1.0.633.0 --license-config "2380451964 iris17,4002,/dur/licenses iris18,4002,/dur/licenses"
The staging directories, in this case both located on the volume mounted for durable %SYS, should be the same, or contain the same licenses. Bear in mind that the InterSystems IRIS Community Edition image described in Downloading the InterSystems IRIS Docker Image includes a free temporary license, and that the --key and --license-config options should not be used with this image. The following script was written to quickly create and start an InterSystems IRIS container for testing purposes. The script incorporates the iris-main --key option to copy in the license key, as described in License Keys for InterSystems IRIS Containers. Docker Compose, a tool for defining and running multicontainer Docker applications, offers an alternative to command-line interaction with Docker. To use Compose, you create a docker-compose.yml containing specifications for the containers you want to create, start, and manage, then use the docker-compose command. For more information, start with Overview of Docker Compose in the Docker documentation. The following is an example of a compose.yml file. Like the preceding script, it incorporates only elements discussed in this document. When a containerized application is upgraded or otherwise modified, the existing container is removed, and a new container is created and started by instantiating a different image with the docker run command. Although the purpose is to modify the application, as one might with a traditional application by running an upgrade script or adding a plug-in, the new application instance actually has no inherent association with the previous one. Rather, it is the interactions established with the environment outside the container  for example, the container ports you publish to the host with the --publish option of the docker run command, the network you connect the container to with the --network option, and the external storage locations you mount inside the container with the --volume option in order to persist application data  that maintain continuity between separate containers, created from separate images, that represent versions of the same application. Create a duplicate container using the same command you used to create the original, including specifying the same durable %SYS location and the same image, but adding the iris-main -up false option (see The iris-main Program). This option prevents automatic startup of the instance when the container starts. Execute the command docker exec -it container_name bash to open a shell inside the container. Follow the procedures outlined in Starting InterSystems IRIS Without Automatic WIJ and Journal Recovery. When recovery and startup are complete, shut down the instance using iris stop instance_name. Start your original container. Because it uses the durable %SYS data that you safely recovered in the duplicate container, normal startup is safe. Docker supports a number of different storage drivers to manage images. As of this writing, InterSystems supports the devicemapper and overlay2 storage drivers for running InterSystems IRIS in production on Linux hosts, and you must configure the Docker daemon to use one of these drivers. If using devicemapper, be sure to read Docker’s explanation of using the storage driver in direct-lvm mode for management of container images. To determine which storage driver your OS uses by default and how to change the driver if need be, see Docker storage driver in the Docker documentation and the Compatibility Matrix. A good approach is to set the Docker Engine storage setting to this alternative volume partition. For example, on Fedora-based distributions, edit the Docker daemon configuration file (see Configure and troubleshoot the Docker daemon in the Docker documentation), locate the ExecStart= command line option for the Docker Engine, and add - as an argument.